1. Preheat the oven to 190ºC and put the onion, celery and carrots into the bottom of a roasting tin. Put the chicken on top, drizzle with oil and season with salt and pepper. Scatter the garlic cloves around the chicken, and add the lemon halves and rosemary. Roast, uncovered for 1 hour 40 minutes or until cooked through with no pink meat and the juices run clear. 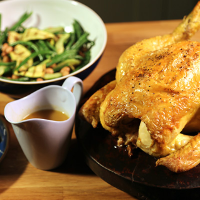 Remove from the oven and take the chicken out of the roasting tin. Set aside to rest. 2. Drain off any excess fat from the roasting tin, then set the tin over a high heat. Stir in the flour, cook for a minute then stir in the wine. Leave to bubble for a couple of minutes then remove from the heat, whisk in the butter and strain into a warm jug. 1. While the chicken is cooking, shave the fennel with a mandolin and slice the preserved lemons. Dress with a mix of olive oil and vinegar and chopped basil. 2. Cook the green beans in boiling water for 2 minutes, or until tender but still crunchy. Drain and refresh in iced water. 3. To make the dressing, combine the olive oil, mustard and red wine vinegar with the chopped garlic and mint. Mix together the refreshed green beans, cooled grilled courgettes, chopped celery and add borlotti beans from the tin. Dress then serve with the chicken and gravy.